Let’s be honest — some culinary traditions are as tiring as turkey’s tryptophan. How many more holidays do you have to suffer eating Grandma’s same carved bird or honeyed ham before you let your palate have a say? Go on the hunt for game. The forests of the American Midwest are flush with rabbit, goose and white-tailed deer. If you have access to any of these delicious sources, what are you waiting for? Meat fed on wild forage doesn’t get much better than this. We recommend a cast iron seared venison backstrap with shallots and thyme in rich porcini mushroom gravy. 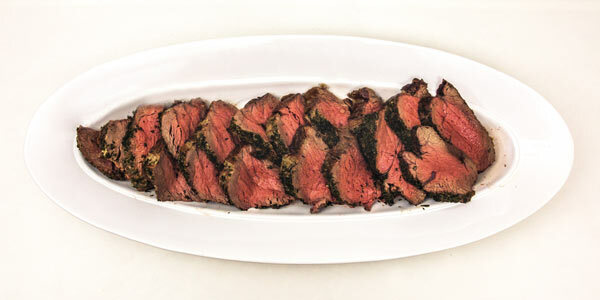 Raise the stakes with a chateaubriand. Your whole family will say oui, please to this thick, center cut of a tenderloin beef filet, popular with French diplomats in the 19th century. We’ve grilled our chateaubriand and have served it up with a red wine reduction and an herbed horseradish crème to wake up the taste buds. Yearn for that tender loin of pork. Beautifully juicy when done right, a good pork tenderloin roast will keep you warm through those winter evenings. It goes great with a whole array of roasted, hearty vegetables like carrots, beets and squashes. We sweetened the deal on this classic roast with a plum and porter glaze. Ask everyone to give thanks and CIT — carve it themselves. Cornish game hens are a fun way to give each of your family members their own personal chicken. These small, whole birds can be stuffed, roasted or deep-fried like larger fowl cousins. We like them baked with lemons and herbs. No matter what protein you serve on your table this holiday season, don’t forget the most important ingredient — love. (Okay, it’s a little cheesy, but we’re talking about food, here. Cheese fits the theme!) A little bit of culinary creativity added to your friends and family dining experiences can make a meal that makes a memory. Coat the pork tenderloin with orange zest and salt. Heat olive oil in a heavy skillet over high heat until the oil shimmers; gently lay the tenderloin into the hot oil. After about 1 minute, gently loosen the meat from the bottom of the skillet, if necessary. Cook until the pork is seared a golden brown color, about 3 minutes per side. Transfer the pork to the lined baking sheet. Roast the seared tenderloin in the preheated oven until a thermometer inserted into the center of the pork reads at least 145 degrees F, about 15 minutes. Remove the pork from the oven and allow to rest for 10 minutes before slicing into medallions. Cook the plums, wine, sugar, and cranberries in a small saucepan over medium-low heat, stirring often, until the plums are soft and the cranberries pop, about 10 minutes. Use a potato masher, or fork to mash the plums and cranberries until well mixed. Put compote into a bowl and spoon over sliced tenderloin to serve. Adjust the oven rack to the lower-middle position. Preheat the oven to 475°F. 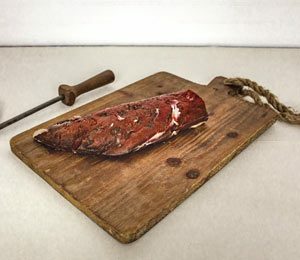 Put the fillet on a baking sheet. Rub the top and sides with olive oil, then sprinkle on the salt, pepper, and parlsey. Roast for 30-40 minutes, or until a meat thermometer reaches 135°F for rare, or 145°F for medium-rare. 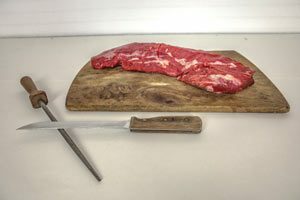 Transfer the meat to a wooden cutting board, and cover with aluminum foil. Let rest for 20 minutes. Once your filet is transferred to a cutting board place your roasting pan on the stove. Add ½ cup of water and heat and scrape the drippings from the bottom of the pan. In a cast iron skillet, heat olive oil until it shimmers in the pan. Add butter, the prepared drippings, and wine. Simmer until it is reduced by half. 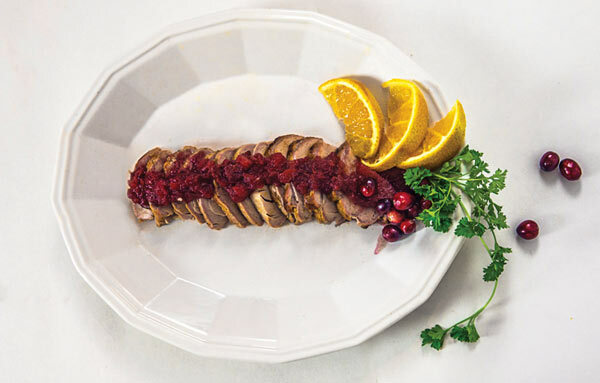 Slice filet into 1 inch medallions and serve with a drizzle of red wine reduction. Make sure that all sinew is trimmed and removed from the venison, pat dry. In a small bowl put olive oil, lemon juice and whisk. Coat the venison with the mixture and rub salt and pepper over the surface. Wrap in plastic wrap and place in fridge for 2 hours. Remove venison from fridge 30 minutes prior to cooking to bring to room temperature. In a cast iron skillet heat 1 tablespoon of butter. When the skillet is hot, place backstrap in the pan and sear on each side (remember it is a round cut of meat so you will be heating on 4 sides). Sear for about 2 minutes on each side. Add another tablespoon of butter to your skillet with the chopped leeks. Once translucent add mushrooms and wine. Scrap the bottom of the pan and cook sauté the mushrooms until softened. 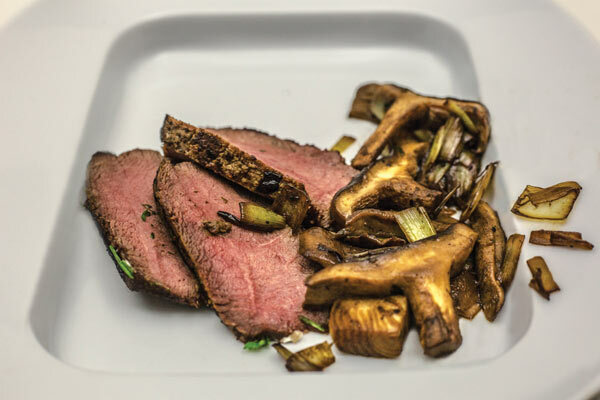 Slice the backstrap into thin slices, and top with mushrooms, serve immediately. Rinse the hens with cold water and pat them dry. Remove the giblet bundles from inside the hens and use for another purpose or discard. Season hens on both sides with salt and pepper and set aside. Cut the lemons in half and juice them into a small bowl. Save the lemon halves to add to the pan as shown in the photo. In a small bowl, combine the lemon juice with the parsley, thyme, garlic 2 tablespoons of the olive oil. Set aside. Heat a large cast iron pan on medium heat. Coat the bottom of the pan with the rest of the olive oil. Transfer the hens and any drippings from the skillet to a large roasting pan. 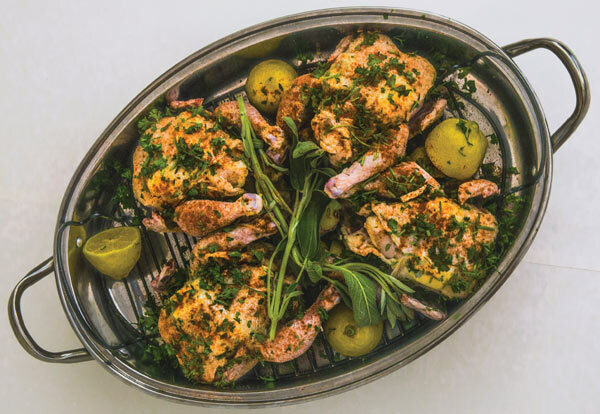 Pour the lemon-herb mixture over the hens and place in the oven for 50-60 minutes or until a thermometer reaches an internal temperature of 165 degrees F.
Remove the pan from the oven and let the hens rest for 10 minutes.